I am still having the lingering after-effects of a book hangover with this book. I loved the hero and heroine, whose romance was filled with witty banter and a reserved but sizzling undertone chemistry that carries throughout the book. 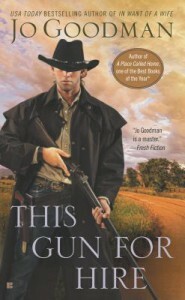 Jo Goodman is a fabulous author who has a great grasp and use of dialogue and likeable characters. But I think she threw the ball out of the ballpark with this one. Although the romance was slow burn, and other than the beginning and ending, which was action packed, I highly enjoyed this book! I also did a joint review with Lou - here at The Book Pushers.